It takes one really dude evil dude to piss off both the She-Devil with a Sword and the Lord of the Jungle. Eson Duul is that dude and he's so vile he has zero respect for man, woman, or beast. Now, he's put himself in the crosshairs of Sonja and Tarzan. Dive into this exciting pulpy adventure. A comic book veteran like Gail Simone is capable of writing just about any genre. Superheroes, horror, fantasy, crime drama, you name it she's done it. She's also adept at writing leading female characters. 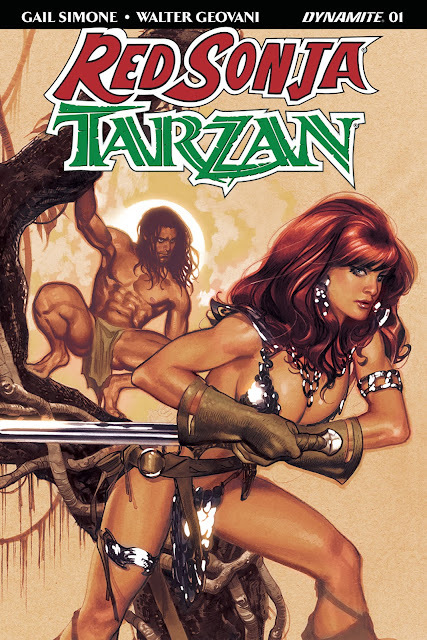 In 'Red Sonja/Tarzan,' she's in her wheelhouse with Sonja and John Clayton aka Tarzan on an adventure of revenge. Duul is as despicable a villain as you'll find in comics or any other medium. It's clear from the jump that he takes what he wants and doesn't care who gets in the way or hurt in the process. A selfish, narcissistic, tyrant of a man, who hunts for trophies with no regard for life or nature. How he has crossed paths with both Sonja and Tarzan establishes the characters' trajectory to join forces against Duul. It's not very often we see a vulnerable, defeated, and wounded Sonja but Simone takes us there. More than just to establish her reason for vengeance but to demonstrate the level of a threat Duul poses. We also see Sonja's empathy for animals, a clear link that will bind her partnership with Tarzan. As for Tarzan, a character with a long history but perhaps not as visible or known in today's comic book landscape. Simone captures Edgar Rice Burroughs' creation and all his complexities. An archetypal feral child raised in the African jungle by the Mangani great apes after his family was marooned and killed, Tarzan is also known as John Clayton, Lord Greystoke. He grows up to inhabit both worlds, the jungle he loves and the proper English legacy of his parents. It is this dichotomy that Duul uses to attack Tarzan and provoke him. Walter Geovani's style invokes the style of Tarzan comics of the past with a modern approach to backgrounds and details. The character designs for Sonja and Tarzan are the highlights here, as they should be. Two images, in particular, stand out one is Sonja in a corset and long dress and the other is Tarzan busting out of his suit. Adriano Augusto adds warm colors, sometimes rich but mostly the panels take on a sepia tone with light browns and yellows for that nostalgic look. 'Red Sonja/Tarzan' is deftly constructed with solid character work and a hateable villain. The set-up is the perfect introduction to these two iconic figures with a shared mission. Simone is at the top of her game and Geovani provides a classic pulp comic look. This title is about to explode.